For thorough and complete dental cleanings in Lawrenceville, Georgia, trust the talented dentist and dental support staff at Lawrenceville Family Dental Care. We are a comprehensive, family dental practice serving children and adults in Lawrenceville and the surrounding areas. We offer high quality, professional dental cleanings as an important part of an overall general dental care plan. Our dental practice is focused around prevention and education and we work hard to help our patients establish good oral hygiene habits to promote a lifetime of good oral health. Dental cleanings are an important part of a comprehensive dental care plan and are recommended every six months for most patients. If you have dental health problems such as tooth decay or gum disease, you may need to receive dental cleanings more often. Lawrenceville Family Dental Care provides comprehensive dental checkups for children and adults in Lawrenceville and the surrounding areas. If you or a member of your family is in need of a checkup, please give us a call today to schedule an appointment with one of our experienced dentist. Our dentist provides each new patient a comprehensive examination that includes a screening for oral cancer, gum and bone diseases, blood pressure and systemic disorders. Routine oral exams are performed on established patients to determine any changes in dental and health status since the previous visit. In addition, gum tissue is carefully measured and x-rays are taken as needed. 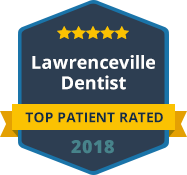 For the highest quality dental cleanings and exams available in Lawrenceville, you can count on Lawrenceville Family Dental Care. Our practice is currently accepting new patients and we would welcome the opportunity to care for you or a member of your family. Our practice accepts most forms of dental insurance and also offers an affordable preventative care package for our valued patients with no insurance. Please contact our office today to schedule an appointment. We thank you for allowing us to take care of your dental needs and we look forward to exceeding your expectations.